For the last few weeks I have been giving a mahjongg clinic in Bryant Park not far from Times Square in New York City. Most of the players that have come have read the park's website and know that they will learn National Mah Jongg League mahjongg, but we did get a few looking to learn to play Chinese style, and one of our clinics turned into a Chinese mahjongg lesson as we all learned together. We found a rules site on the internet and began to learn the basics. We removed the jokers from our set and we put our cards away, ready to learn something new. I've set forth some of the basic differences below. If you are interested in learning Chinese style I would recommend Tom Sloper's book "The Red Dragon and the East Wind. The rules for NMJL and Chinese mahjongg are set forth in greater detail - what follows is just my newbie's impression of a game that is the same yet totally different. Okay so first we learned that there not only is an East but a North, West and South, and this means that if you pick wind tiles that are the same as your seat, you get more points. Breaking the wall is somewhat more complicated than just throwing the dice and starting to deal. I felt like a new player does when they do "right, across, left, left, across, right" for the first time. Huh? What? 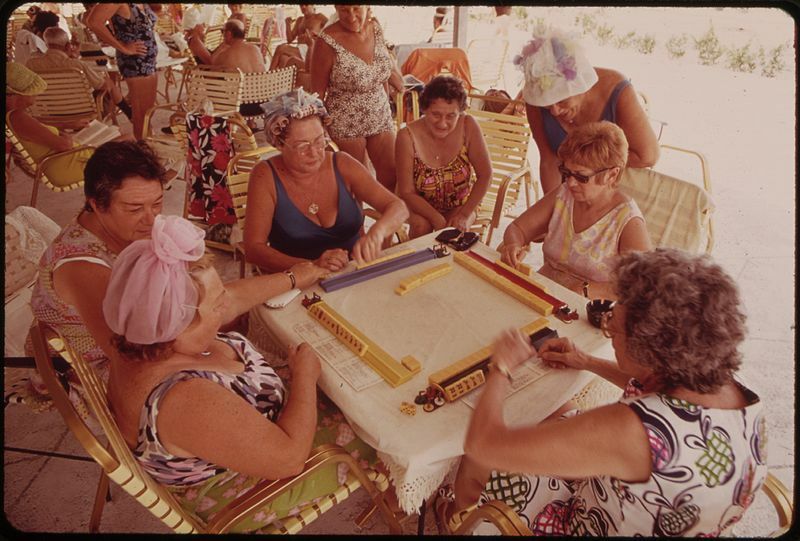 In Chinese mahjongg there is no Charleston. What we might call the hot wall is called the dead wall. You get your tiles and start to play. Flowers are called "bonus tiles" and are not used in the hand. If you get dealt or pick flowers (or "season" tiles) they are put on the side and replaced with tiles picked from the dead wall. You can get points for them at the end. The basic premise of the game is similar to ours in that a winning mahjongg hand is 14 tiles. Instead of hands on a card, a winning hand is made up of pungs, kongs or chows (which is a run like 123) topped off by a pair. There is no regard to suit, so a winning hand may look like this: 888 123 777 EEE RR. Most of the hands on our card would not qualify as a winning hand, either because they have two pairs or no pairs or use flowers. In fact, on this year's card I could only find two hands that would qualify: 111 222 111 222 DD and NNNN EEEE WWWW SS. If someone throws a tile, they do not say the name!! Saying "4 dot" will brand you as an American mahjongg player as surely as saying "cawfee" will brand you as a New Yorker. You place your tile neatly in front of you - not making a mess so no one knows whose discard is whose. When you want a tile you have to say "pung" or "kong" or "chow" instead of "take" or "call" or "gimme". And you can only call for a chow if you are to the left of the person who discarded. Anyone can call for a pung or kong and you must expose. But if you expose a pong and then pick the fourth tile you may add it to your pong to make a kong. Capiche? When someone makes mahjongg the pungs, kongs and chows are given point values, so if you are East and you have a kong of Easts, that is worth more than a kong of 3 bams, say. Certain tiles are worth more than others - 1's and 9's are called terminals and score higher. A hand of all terminals is very high scoring. Dragons and winds are called honors and are worth more. You may also win with seven pairs of anything - what we call "atomic". So there is no card but there is an endless variety of hands and combinations. The trick is to get combinations that score high and that's where it gets complicated. You need to know exactly how much everything is worth. A hand with four concealed pungs is worth more than a hand with three exposed kongs. There are special hands like all terminals or all honors; all bams (but no terminals or 5s) and hands composed of 4s, 5s and 6s. We may look at those hands and think they are cockamamie, but that is exactly the reaction I have had from Asian players when they look at the NMJL card. 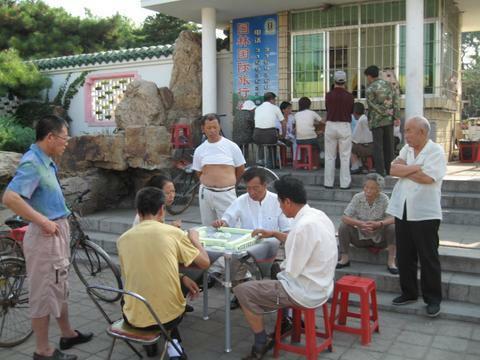 So Chinese mahjongg was interesting to learn and I applaud anyone who can play both styles well. Because whether I taught "our" style or Chinese style, it was easy to teach the basics, but we all know how long it takes to play well - it's the easiest game you'll ever lose! But that's why we love it no matter what version we adopt.